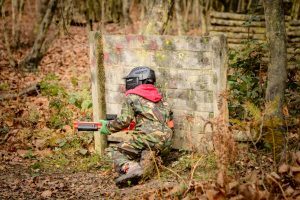 Our Broxbourne kids paintball site has been specially designed for the kids low impact game. Purpose built, with a focus on younger paintball players, this site provides and amazing low impact paintball experience. With close access from Broxbourne, Cheshunt and North London. Access is easy from the A1 and A10 making travel a breeze from anywhere in Hertfordshire or North London. Childrens paintball for 8-15 year olds. Starting from 8 years old, our childrens paintball game goes up to 15 years old. We’ll even allow parents to play with the kids at this site. Using low impact paintball guns, with all paintball included, we run games over a 2 hr session. Food and drinks are available to purchase on site. When your game finishes, you’re welcome to stay behind and grab some lunch. Games at Broxbourne start at 10am, midday and 2pm and last for 2 hours. During the summer months early evening games can also be organised. Midweek games are available subject to minimum numbers. Please note: this site does not provide overalls so wear old clothes. You can bring gloves or purchase on site on the day. 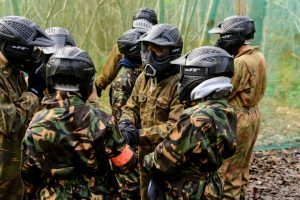 For more information/booking visit our kids paintball page or give us a call on 0333 577 6336.